I feel very fortunate to have befriended Bill Kaiwa long before he left this life. (This is not the case with many of my Hawaiian music heroes.) I would not call him a “friend” as we didn’t spend that much time together. But I would refer to him as an acquaintance who was very open to accepting a phone call from me and having a lengthy conversation with me about our mutual Hawaiian music heroes – that is, as long as it didn’t conflict with his tee time, which for those who knew him well, seemed to be perpetual. Kaiwa was an extremely influential figure in Hawaiian music himself in his time. He appeared on the Hawai`i entertainment scene during the critical period when many of the elder statesmen (and women) of the genre were passing away and many of the new generation had no interest in the music of the generation before. The young people who did find interest in their Hawaiian roots may have had the best of intentions but often presented the music and the history of it carelessly – playing a wrong chord or singing a wrong note here and there, and mispronouncing a Hawaiian lyric or two. This was where Bill Kaiwa was an important role model for other musicians in this period. Known as “The Boy From Laupahoehoe” for his breakout hit song composed by Irmgard Aluli, Kaiwa had no connections to the small town on the Big Island but was, in fact, from Papakolea on O`ahu and later hānai (or adopted in a Hawaiian tradition) to a family on Kaua`i. (In later life he kept homes in Kane`ohe on the windward side of O`ahu and a home on Kaua`i – but never the Big Island.) 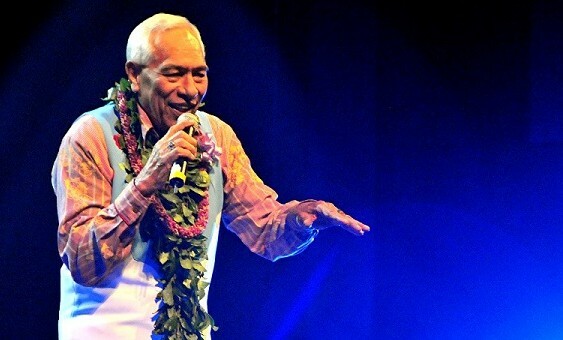 Despite being only in his late 20s when he made his splash on the Hawaiian music world, he did so with the stateliness of the kupuna – not only in the way he dressed and spoke, but in the way he presented the music of yesteryear and, perhaps more importantly, in the way that he cared for it – gathering up every precious forgotten song that would be shared with him by Lyons Nainoa or John Almeida, squirreling away the words and the melodies in his memory banks (for he could not read or write music). When I would call him up and ask him to teach me a song, he would simply sing it to me over the telephone. This is about as traditional a form of cultural transmission as one can find in the modern era. Kaiwa was the original Renaissance man – his talents going far beyond his musical abilities. In addition to being a scratch golfer, he was also an artist specializing in painting and sculpting. As I write this, there sits beside me on the end table in my studio a poi pounder carved of beautiful Hawaiian milo wood – a gift from Bill Kaiwa. And still this unassuming man signed his autographs “Billy.” If one could rip time and space and patch them back together to suit themselves, I could envision Uncle Bill whiling away the hours chatting with King Kalākaua for I think the two would have had much in common. But despite being a Renaissance man, Kaiwa’s music was not stuck in another time. He found the means of being respectful to Hawai`i’s past while forging his own path forward. With the help of a like-minded arranger – Benny Saks – Kaiwa took traditional Hawaiian song in a direction suitable for and attractive to the young, hip generation – combining century-old Hawaiian-language compositions with elements of rock-and-roll, R&B, doo-wop, lounge jazz, and (a little later, at the dawn of the 70s) country. Ho`olohe Hou Radio will celebrate Bill Kaiwa’s February 25th birthday with a week-long tribute chronicling his lengthy career beginning to end. Tune in to Ho`olohe Hou Radio the week of February 22nd through February 29th to hear some of these forgotten recordings that changed the future of Hawaiian music for all who came after.